Stanley Metcalf circa 1914 on South Street, Auburn, NY. Roselawn is in the background. His nephew Edwin R. Metcalf is on his right; nephew Frank R. Metcalf is on his left. Colonel Stanley Warren Metcalf, of 91 South Street, Auburn, NY, one of Auburn's prominent industrialists died Thursday September 11, 1980. He had devoted his entire business career to the Columbian Rope Company having been elected a director in 1916, followed in 1919 by training in all departments of the mill. From 1921, when he was made Assistant Treasurer: 1927 Assistant Secretary: 1928 Treasurer: 1939 Vice President and General Manager: 1941 President: 1952 Vice Chairman: 1953 Chairman: until 1972 when he became Honorary Chairman for three years, his years of service to the Company spanned a notable fifty-nine years. 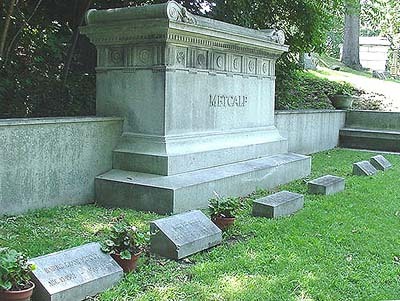 Colonel Metcalf was educated in the Auburn Public Schools, Auburn High School, the Hill School, Pottstown, Pennsylvania 1913, and Yale University, B.A. 1917. When World War 1 broke out, he left Yale University in early April 1917 as a volunteer in the French Army. He was attached to an ambulance unit on active front line duty until October 1917 when he enlisted in the American Army and was commissioned Second Lieutenant in the Field Artillery, Second Division and served with this famous Division until the end of the War. Being recalled to active duty in World War II, Colonel Metcalf was first assigned to the 3rd Port of Embarkation, New Orleans. He was promoted to Colonel in 1945. He was a Director of the National Bank of Auburn from January 1928 to December 1949. He was elected a director of Auburn Dry Goods Corporation ("The Big Store") in 1947 and became its President in 1966 through 1976. Stanley Metcalf was the youngest of three sons of Edwin D. Metcalf; his brothers were Edwin F. (1876-1949) and Harold G. (1883-1971). Stanley was married to Frances Bloomfield (1902-1961), and they have one son, Stanley W. Metcalf Jr.